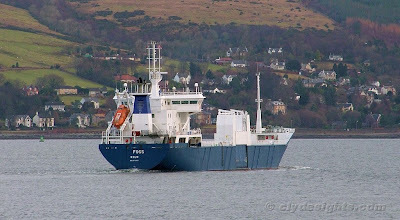 Arriving from Skogn, the Norwegian palletised cargo ship FOSS, owned by DFDS Logistics, was making her way up the main with her regular cargo of newsprint towards Greenock. After discharging, FOSS would be returning directly to Norway - in the past she would often call at Belfast in addition to the Clyde. In common with some of her fleetmates, FOSS lost her DFDS branding following a restructuring of the company last year.